Why do I get up at the crack of dawn, go out driving on country roads in snowstorms, get stuck in snow and mud, get lost and have no reception on my phone to find my way back to civilization? For photography, of course! I really started to love photography when the digital camera appeared. Before that I enjoyed taking photos but never had the patience to wait while they were developed. Living in a state with four distinct seasons certainly keeps me from getting bored with my camera. There is always something new and different. Spring and summer are such exciting times as the wildlife return to their homes and new babes start to appear. Winter brings the sharp winds as it blows the thick snow up against the trees and grasses. At times when the fog comes in and the snow clings to the bare trees, one feels they are in their own fairyland. Even though I grew up in the fierce Minnesota winters I soon forget the cold as my imagination takes over in the snowy patterns of the wind blown fields. Fall with its unbelievable colors has to be my favorite time of year. I'm reminded time and time again of the artist as he paints his way through the paths of the earth. I'm usually out traveling on country roads, dead end streets and what I call 'cow paths' in most kinds of weather. The discoveries I make there are always more exciting and fun than the ones on the city streets. Photography holds all the seasonal memories together but especially places of serendipity in which I find the unexpected. All of my galleries are broken down into wildlife; country life; flowers and plants; still life; sunrise and sunsets; and landscapes; and are available on my online store, www.sharonsserendipity.com. I also carry mugs, phone cases, mouse pads, and other photo gifts. Need a card for a special someone? You can also make your own cards . I hope you have found your own serendipity but if not, perhaps you can find it here in the pages of my website. 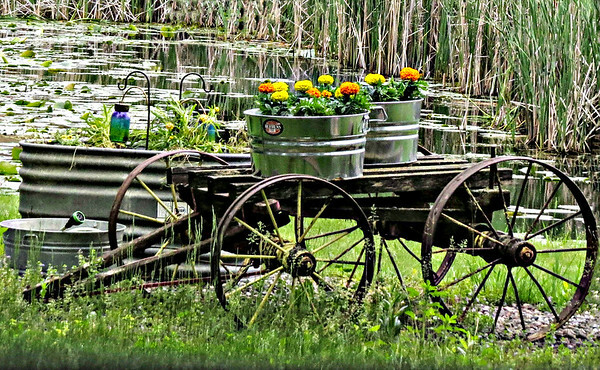 An old wagon sits with tubs of marigolds. 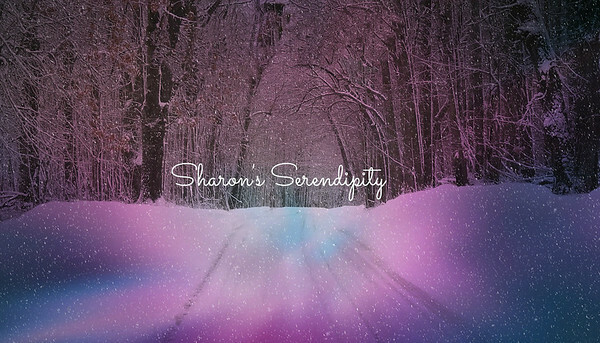 Since "Sharon's Serendipity" is a website, we are open 24 hours a day. If you need to talk to me about any of my photos or would like to negotiate a special price, please call me. I may be out shooting in an area with no phone service so please leave a message and I will call you back asap. All of my products are 100% guaranteed.